Thousands of lives could be saved every year in Pakistan if common people know how to do compressions-only CPR (CPR). We’re providing CPR training across the Pakistan to make sure that when someone has a cardiac arrest, the Pakistani public know what to do to save a life. A comprehensive CPR stands for Cardio-pulmonary Resuscitation. Cardio means “of the heart” and pulmonary means “of the lungs.” Resuscitation is a medical word that means “to revive” — or bring back to life. Compressions-only CPR (CO-CPR) is a skill with focus on pushing hard and fast on the chest without giving rescue breaths. Cardiac problems are more common than you think, and they can happen to anyone, at any age, anywhere and anytime. It causes the person to fall unconscious and stop breathing. Without CPR the person will die within minutes. The life you save with CPR is mostly likely to be a loved one. More than 70% of arrests occur at home. By performing chest compressions, you are pumping blood, in the circulation system, throughout the brain and body to delay the tissue death and to extend the brief window of opportunity for a successful resuscitation without permanent brain damage. Every second counts – any delay can quickly reduce a person’s chance of survival. Shout for help – if someone is nearby, ask them to stay as you might need them. If you are alone, shout loudly to attract attention, but don’t leave the person. Look, listen and feel for no more than 10 seconds. Don’t confuse gasps with normal breathing. If you’re not sure if their breathing is normal, act as if it’s not normal. If you’re sure the person is breathing normally, then put them in the recovery position and call 1122/EMS. check if AED is available and use it. If you can’t find anyone to help, call 1122/EMS before you start CPR. Place the heel of one hand in the center of their chest. Place your other hand on top of the first. Interlock your fingers. Push hard and fast. Don’t worry about hurting someone. A cracked rib can be mended – just concentrate on saving a life. If you’re feeling tired, and there’s someone nearby to help, instruct them to continue. It’s not as hard as it looks. 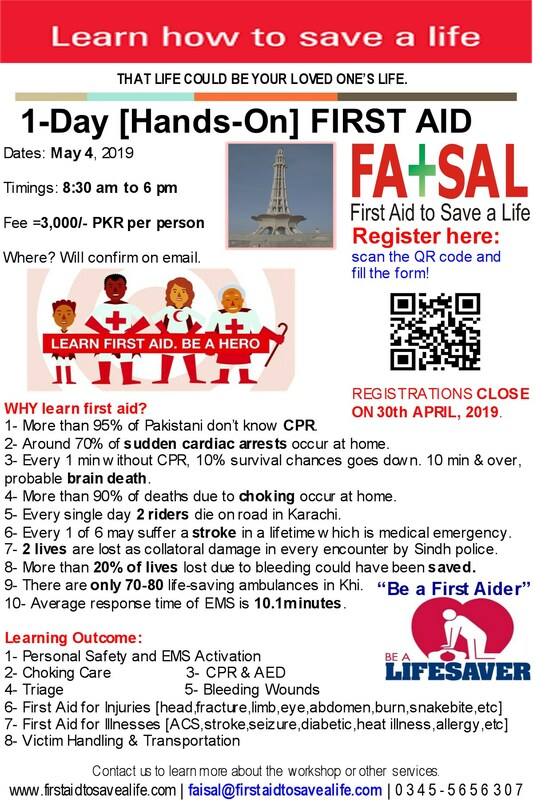 FATSAL is pleased to announce series of CPR Workshops to raise awareness about cardiac emergencies and train people in CPR and anti-choking skills to save lives. These workshops are open for age 15 and over. Pre-registration is must. only a 2 hours duration. There are 3 sessions each day to train more people in life-saving skills like CPR and choking care. You as a participant can select date and session of your choice; once your fee is received. To maintain quality of training and participant to student ratio, we will only allow 20 participants in each session. The workshop fee includes certification, quick card & refreshment. See our upcoming schedule to mark your calendar. Remember, don’t delay because these are very competitive rates and we have limited seats too. This entry was posted in First Aid CPR and AED and tagged 1-Day Training Programs, 2 steps of CPR, 2014 training course, 2015, 2015 trainings, 2017, 2018, ABC of Resuscitation, Abdominal Thrusts, accredited first aid and cpr trainings, Accredited first aid training courses, accredited first aid trainings in pakistan, accredited training program, ActFastMedical, Adult Child Infant CPR, adult cpr, advance first aid, Advanced First Aid, AED, AED Implementation Program, aed training, aed training programs, aed trainings in pakistan, AEDs, AHA, AHA First Aid Training Courses, American heart association, anti choking trainer to teach choking care, anti choking vest, anti snake venom vials and pressure bandage, anti-choking care, anti-choking trainer, anti-snake venom vials, ARC First Aid Training Courses, automated external defibrillator, basic first aid, Basic First Aid and tagged 1-Day Training Programs, basic life saving skills, basic life support, become a lifesaver, bleeding control techniques, blended cpr training programs, blood loss, BLS, cardiac emergencies, Cardio Pulmonary Resuscitation, Cardiopulmonary Resuscitation, care to relieve choking patient, Child Anti-Choking Technique Abdominal Thrusts Heimlich Maneuver, child cpr, choking care, CO-CPR, COCPR, Community CPR courses, community lifesaver, community of lifesavers, Community responders, community service projects, community service projects in balochistan, community service projects in Capital, community service projects in Faisalabad, community service projects in GB, community service projects in gilgit baltistan, community service projects in Hyderabad, community service projects in Islamabad, community service projects in karachi, community service projects in Kashmir, community service projects in kpk, community service projects in Lahore, community service projects in pakistan, community service projects in punjab, community service projects in Rawalpindi, community service projects in sindh, compressions only, compressions only CPR, control of bleeding in snakebites, conventional CPR training vs online CPR class, courses, CPR, CPR 2 steps technique, cpr and aed, CPR and AED for Adults, CPR and students, CPR certified, CPR for community, CPR for families, CPR Hands On Practical Experience, CPR learn to save a life, CPR learning by doing, CPR learning links, CPR practical training, CPR practitioner, CPR qualified, CPR responders, CPR save a life, CPR save lives, CPR saves life, CPR trained, cpr training, cpr trainings, cpr trainings in lahore, CPR volunteers, CPR workshop, CPR workshop based on AHA guidelines, CPR workshop based on latest AHA guidelines, CPR workshop for ACI, CPR workshop for adult child infant, CPR workshop for all, CPR workshop for complete age range, cpr workshops, CPR Workshops in, CPR Workshops in Balochistan, CPR Workshops in Hyderabad, CPR Workshops in Islamabad, CPR Workshops in Karachi, CPR Workshops in KPK, CPR Workshops in Lahore, CPR Workshops in Pakistan, CPR Workshops in Pakistan in 2018, CPR Workshops in Pakistan on Restart a Heart Day, CPR Workshops in Pakistan on World First Aid Day, CPR Workshops in Pakistan on World Heart Day, CPR Workshops in Punjab, CPR Workshops in Quetta, CPR Workshops in Sindh, CPR workshops on world heart day, CPRsaveslife, defibtech aed, discount offers, discount offers on trainings, emergency care and first aid, emergency first aid, Faisalabad, first aid, first aid and cpr, first aid courses in 2017, First Aid CPR and AED, first aid cpr and aed training in faisalabad, first aid cpr and aed training in hyderabad, first aid cpr and aed training in islamabad, first aid cpr and aed training in karachi, first aid cpr and aed training in kohat, first aid cpr and aed training in lahore, first aid cpr and aed training in Pakistan, first aid cpr and aed training in peshawar, First Aid CPR and AED Trainings in Faisalabad, First Aid CPR and AED Trainings in Gujrat, First Aid CPR and AED Trainings in Islamabad, first aid cpr and aed trainings in karachi, First Aid CPR and AED Trainings in Lahore, first aid cpr and aed trainings in multan, First Aid CPR and AED Trainings in Pakistan, First Aid CPR and AED Trainings in Punjab, first aid for adult, first aid for all, first aid for amputation, first aid for animal bites, first aid for asthma, first aid for baby, first aid for back injuries, first aid for bosebleed, first aid for brain injuries, first aid for breathing problems, first aid for burn, first aid for caregivers, first aid for chemical burn, first aid for choking, first aid for cold emergencies, first aid for concussion, first aid for dengue fever, first aid for ear injury, first aid for electrical burn, first aid for everyone, first aid for fainting, first aid for fall from height, first aid for families, first aid for for not breathing, first aid for for seizure, first aid for fracture, first aid for frostbite, first aid for head injury, first aid for heart attack, first aid for heart failure, first aid for heat emergencies, first aid for heat exhaustion, First Aid for Heat Illness, first aid for heat stroke, first aid for hot water burn, first aid for infant, first aid for nosebleed, first aid for patients, first aid for snakebite, first aid for steam burn, first aid for stoke, first aid for sun burn, first aid for unresponsive, first aid is for everyone everywhere, first aid to control bleeding, First Aid Train the Trainer Courses, First Aid Train the Trainer Courses in Karachi, first aid training, first aid training and floods, first aid training azad kashmir, first aid training badin, first aid training balochistan, First Aid Training Courses in 2016, first aid training courses in hyderabad, First aid training courses in islamabad, first aid training courses in karachi, First Aid Training Courses in Karachi Pakistan, first aid training courses in lahore, first aid training faisalabad, first aid training for fitness instructors, first aid training for fitness trainers, first aid training for gym instructors, first aid training for physical instructors, first aid training for physical trainers, first aid training for small businesses, first aid training for teachers, first aid training for teachers in Australia, first aid training for teachers in canada, first aid training for teachers in Gulf, first aid training for teachers in Kuwait, first aid training for teachers in Oman, first aid training for teachers in Saudia, first aid training for teachers in UAE, first aid training for teachers in USA, first aid training gilgit, first aid training guidelines 2015, first aid training hattar, first aid training hyderabad, first aid training islamabad, first aid training islamabad-rawalpindi, first aid training karachi, first aid training kohat, first aid training kot lakhpat, first aid training kpk, first aid training lahore, first aid training multan, first aid training murree, first aid training pakistan, first aid training pehsawar, First Aid Training Programs and tagged 1-Day Training Programs, First Aid Training Programs and tagged 2014, first aid training providers, first aid training punjab, first aid training quetta, first aid training rawalpindi, first aid training rawat industrial estate, first aid training sindh, first aid training skardu, first aid training sundar industrial estate, first aid trainings for free, first aid trainings in 2015, first aid trainings in 2018, first aid trainings in islamabad, flood and first aid training, free first aid courses, free first aid trainings in islamabad, free first aid trainings in Karachi, free first aid trainings in Lahore, HAINES, HAINES Position, haines recovery position, Hands-on CPR training, hands-on training, Hands-Only CPR, heart, heart health, heart problems, Heimlich Maneuver, How long should I continue CPR?, how to do cpr, how to perform CPR, how to relieve choking person, how to use anti choking trainer, hse courses in islamabad, HSE courses in pakistan, hse training courses in islamabad, hse training courses in karachi, hse training courses in lahore, infant CPR, Instructor Development Courses in 2017, international aed training courses, international cpr courses, international first aid courses, international first aid cpr aed training courses, international first aid training center in Afghanistan, international first aid training center in bangladesh, international first aid training center in Bhutan, international first aid training center in China, international first aid training center in India, international first aid training center in Iran, international first aid training center in Maldives, international first aid training center in Nepal, international first aid training center in pakistan, international first aid training center in Saudia, international first aid training center in UAE, international first aid training centers in asia, international first aid training centre in pakistan, international first aid-cpr-aed courses, International Training Certification Course, Is a cardiac arrest the same as a heart attack?, islamabad, Karachi, karachi sindh, karachiites, karachitan, karachite, Lahore, latest aed guidelines, latest cpr guidelines, latest first aid guidelines, Latest first aid training guidelines, Latest first aid training guidelines of 2015, Learn CPR save lives, life saving skills, Lifesaver, lifesavers, lifesaving skills, make your promise, make your promise on world heart day, medic first aid international, MEDIC First Aid International Courses, Medic First Aid International in Karachi, MEDIC First Aid International Trainings in Faisalabad, medic first aid train the trainer, medic first aid trainings, modified haines position, modified recovery position and cpr, My heart your heart, nation of lifesavers, new courses launched in 2014, occupational safety training institute pakistan, October, online CPR training, oxygen first aid for emergencies, Pakistan, Practical CPR training, practical snakebite first aid training, practical snakebite first aid training in Pakistan, prcs sindh, primary assessment, reasons children may need cpr, Restart a Heart Day, Restart a Heart Workshop, save a life be a hero, SCA, SDG, SDG 11, SDG 3, SDG 3 Good Health and Well-being, SDG Good Health and well-being, SDG11, SDG11 Sustainable cities and communities, SDG2020, SDG3, September, Sindh, snakebite prevention and floods, spinal injuries and CPR, spinal motion restriction, startup, startup business, startups in lahore, steps to form CPR, sudden cardiac arrest, Sustainable Development Goals, Sustainable Development Goals 11, Sustainable Development Goals 3, The reasons to learn CPR, training course, training for teachers in canada, training program, trainings, trainings in 2015, trainings in 2018, Trainings to up lift SDG, video illustration of CPR, what are two steps of CPR, What does the American Heart Association (AHA) say about AEDs, what is cardiac arrest, what is cpr, what is heart attack, what is primary survey, what is QCPR, what is recovery postition, what is SCA, What will happen if their heart is beating but they are not breathing?, WHD, WHD2018, why 30 compressions, Why become CPR aider, Why become CPR certified, Why become CPR saver, Why become CPR trained, Why learn CPR, why parents should learn cpr and choking care, Why teach CPR, Workshops in Islamaabd, Workshops in Karachi, Workshops in Lahore, Workshops in October, Workshops in Pakistan, Workshops in Rawalpindi, Workshops in September, world first aid day, World First Aid Day in Karachi, world heart congress, world heart day, world heart day 2018, World Heart Day and Heart Talks, World Heart Day and Heart Walks. Bookmark the permalink.